For the first time ever, Barbie® asked the world to help her select her next career. Over the past few months Barbie® did research around the world and also conducted an online voting campaign where we have called upon the world to vote for Barbie® doll’s next career …. The polls closed on February 10th and over half a million votes were counted! … The winner of the popular vote is Computer Engineer. 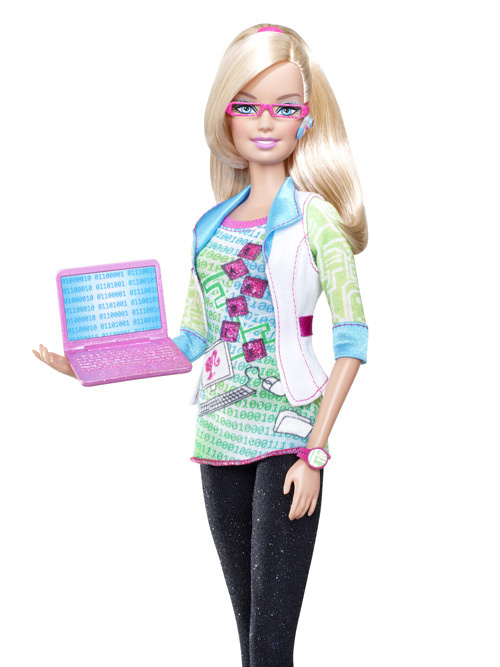 Computer Engineer Barbie®, debuting in Winter 2010, inspires a new generation of girls to explore this important high-tech industry, which continues to grow and need future female leaders. A cool side note: Mattel actually enlisted the Society of Women Engineers and the National Academy of Engineering to help design Barbie’s look and accessories—and Barbie is decked out quite well, from the binary t-shirt to the bluetooth headset to the pink laptop (with binary on the screen that spells out “barbie”) to the stylish pink glasses. But how much does Barbie’s career matter? How influential is Barbie on girls’ career choices? I like this statement because it speaks to a couple of different aspects: the importance of technical role models for young girls, and breaking the stereotype that computer science/engineering is not a “useful”, “relevant”, or “helping” field. This is so exciting to me. I might actually buy this Barbie and put her in my office. I can’t describe how….validating this feels. Part of me feels that is pathetic, but part of me feels proud that the forces of the world united to show Mattel that people want Barbie to be a nerd. Can you imagine? How many women (and men) nerds out there joined together for this? This tells me that I am not as alone as I feel sometimes. That there are other women out there like me, and men…who are supportive. This is not some little online poll, this is a vote that made an international toy giant choose Computer Engineer for Barbie’s next career! I am gushing. I am embarrassed by my joy…. Computer Engineers don’t have to be Mountain Dew-addled guys who haven’t showered in 4 days. I know a few of those, but they are vastly outnumbered by nice normal people – and this is a truly widespread way of reducing that stereotype. Computer Engineers can be girls. Computer Engineers can wear cute (albeit geeky) cloths. Computer Engineers can have long, lustrous, beautiful hair. Computer Engineers….can be Barbie. And maybe now, so will a lot of little girls. Who knows, maybe I’m putting to much stock into this. But it’s such a lonely world out there for us girl geeks….that this makes me really quite happy. This, again, speaks to the importance of role modeling, but also speaks to the validation aspect: if Barbie can be a computer engineer, then it’s ok for “normal” people to be computer scientists and engineers, too. So are we putting too much stock in Barbie? Are we reading too much into her career choice? Will we see a surge in girls interested in computer science and engineering in 10 years? Hard to say. But let me share a bit of my own story as another reference point. I was a somewhat normal (don’t laugh too hard) but nerdy kid growing up who loved math and science. And while I had wonderful role models growing up, I had no technical role models at all. So I had these nerdy interests but no real idea what people could do with them, career-wise. It was my high school guidance counselor who clued me in to the world of engineering, and the rest, as they say, is history. And it’s not like you can just accidentally take a class in engineering and decide to major in it—you have to know going in to college that engineering is what you want to do. So that intervention by my guidance counselor was crucial to where I ended up, career-wise. And more importantly, this intervention from my counselor was the one and only message I heard about engineering while growing up. But that’s all it took: one message from an adult I greatly respected. So what messages do girls hear about technology growing up, and about their place in the technical world? Unlocking the Clubhouse, the seminal book by Jane Margolis and Allan Fisher, tells us that girls often aren’t getting the message at home that being into computers is socially or intellectually acceptable. Peer pressure in junior high (and even before then) sends the strong message to girls that being a computer nerd is often a social death sentence. And the media? Well, how many images of successful women computer scientists have you seen on the news, on commercials, on TV, in movies, online, etc. lately? Barbie is an icon, like it or not. And she can send a powerful message to young girls. So in the face of all the other negative messages about computer science that our girls are hearing, why not have Barbie rail against that message and present an alternative, a role model and anti-stereotype? Tomorrow afternoon, I need to go in to my Intro to CS class armed with a pep talk. The reason? I’ve inadvertently slammed them with two assignments in a row that were more challenging than I intended, and I sense that morale is low. This term I’m trying a new approach to teaching intro. Rather than using the usual topics-based approach (loops, conditionals, etc), I’m using a case-study approach. Each week we look at a different problem, such as cryptography, or image processing, or dealing with large datasets, and then learn the relevant CS concepts in the course of studying the case studies. By and large this has worked really well—I’m seeing a much more nuanced understanding of the typical CS concepts on the part of the students, and the students have gotten quickly comfortable with even the most traditionally tricky concepts. And, it allows me to assign really cool problems in class, in labs, and on homeworks. Here’s the catch: The students are still in the beginning stages of learning how to “think algorithmically”, not to mention think in a computer language—essentially, they are learning a new language. Which means that they still need to be working on problems that are easy to grasp, and small-ish in scope, so that they don’t lose the forest for the trees. So I find myself trying to find cool problems that are still small and accessible. After teaching Intro as many times as I have, I should be pretty good at this, but it’s still a fundamental struggle, and I still, occasionally, get it wrong. It would have been much easier to give a toy problem (a small, straightforward calculation-type problem), and perhaps from a skills perspective the students would have gotten the concept more quickly that way. But part of my role as Intro professor is to fire the students up about the possibilities of CS. I can get the students to learn about manipulating items within a list by, say, having them write a program to find the maximum value in a list of numbers, or I could teach them the same thing by having them find the stock with the highest gains over a five-year period. By taking the approach that I am, I’m betting that the latter assignment will stick with them longer and ultimately drive home the lesson much more effectively. The risk, though, is that the lesson gets lost in the details of solving the problem, and the problem masks the concept. When this happens, the students can get really (and understandably) frustrated, and blame themselves (“This was hard—I must not be any good at this. Computers hate me!”). So tomorrow I will go into class and talk about how faculty sometimes make mistakes in judgment, and remind them that what they are doing, and learning, in this class is stretching them in ways they’ve never (probably) stretched before, and that stretching can sometimes feel very uncomfortable. And also, truthfully, remind them that they’re doing much, much better as a whole than any other Intro class I’ve taught, period, and that really says something about how far they’ve come. I just hope they buy it. * In a future post, I’ll talk about this particular mentality among Carleton students and why it’s particularly frustrating from the faculty perspective.